Susan Brown was born in Yorkshire. She studied at Leeds Polytechnic between 1976 and 1979 gaining a BA Hons in Three Dimensional Design. Susan Brown has centred on two main areas, interior design and contemporary painting. Brown has completed numerous commissions and several projects as both designer and contemporary artist. Susan Brown paintings are bold and striking . Her architectural studies explore the rhythm and movement within buildings and interiors and her abstract paintings are inspired by still life subjects and landscapes, focussing on texture and pattern. Susan Brown paintings appear in many notable private and public contemporary art collections these include: Halifax Plc, Allied Domecq, Dame Janet Baker, Sir George Martin Trust, Universities of Sheffield and York and many others. 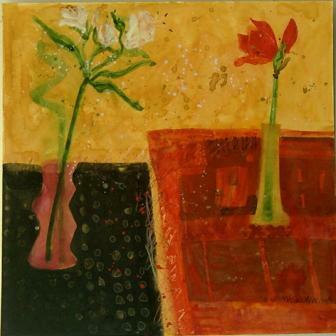 In addition to Red Rag Modern Art Gallery in the Cotswolds Susan Brown has exhibited her paintings extensively at other leading British and Scottish modern art galleries.